Having a problem with my recently acquired Pinbot machine. The LCD score displays will randomly go blank, sometimes in the middle of a game and sometimes they're blank when the machine is first turned on. It can last for days, or just several minutes. Seems to be no rhyme or reason to the behavior. Everything else is fine, and I can play a game, but with no idea what my score is or even what ball it is. I don't see any loose connectors or burned out fuses. Unplug and plug in the connectors at both ends to reseat the connections. You may have to reflow the solder on the header pins. I have reseated the connectors with no effect. 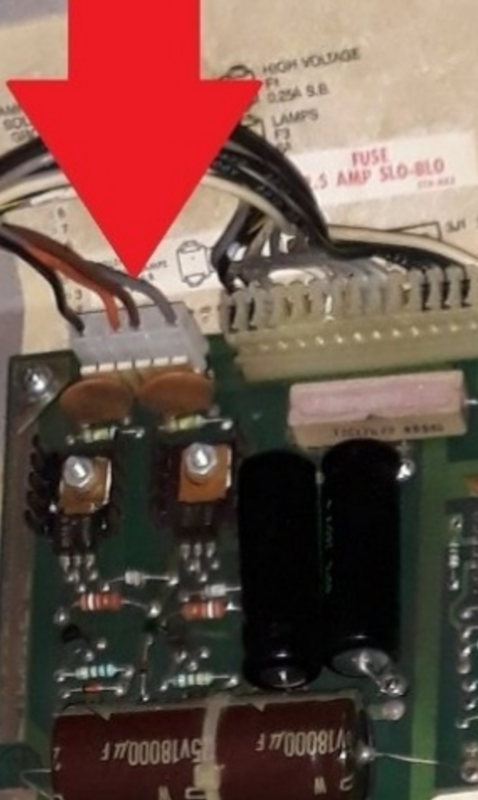 As for header pins, is that where the connectors meet the main circuit boards, or the boards on the back of the swinging door? It's the female connector on the circuit boards at both ends of the harness. A cold solder joint can develop a crack over time and cause a loss of continuity. Especially on a 30+ year old board. 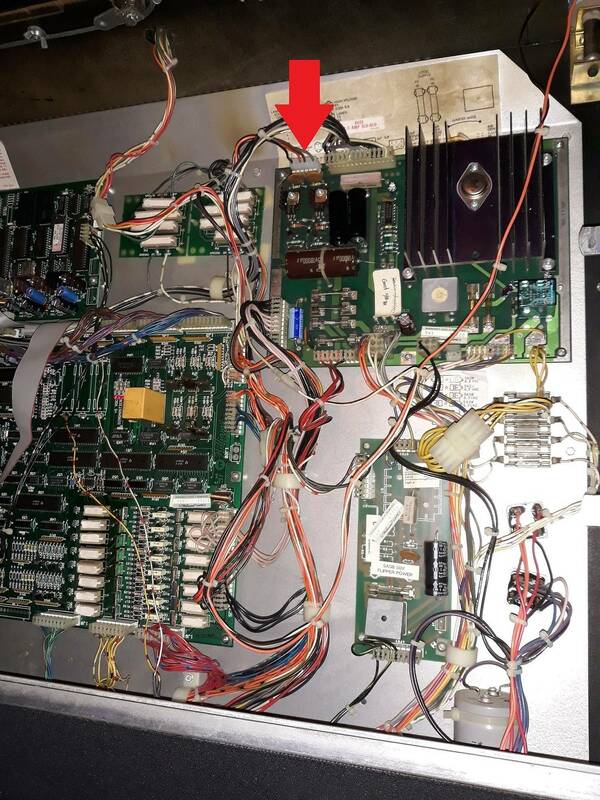 The other problem area could be the high voltage board and it's connections. The best way to troubleshoot is with the schematics and multi-meter. Are they gas plasma or LED? There are no lcd displays for sys11 that im aware of. That being said it does sound like youre loosing voltage to them, when not working check your test points for the correct voltages. I've got a multimeter but I'm by no means knowledgeable in how to use it. Looks like I've got a homework assignment! Wow! I guess you CAN find everything on the internet. Thanks. I'm in York if you need assistance. My background is more Bally related, but electronics is my profession. Thanks, I appreciate that! I have to say, this community is very impressive. Well, I traced the power wiring from the display's board back to the board on Pinbot's top. It's marked with a red arrow. I unplugged that connection and reseated it and the display came back on. We'll see if that solves it or was just a temporary blip. Unfortunately, it was only temporary. The display went dead again. I'll try the multimeter and see what I can find. It could be cold solder on the power supply male connectors, or poor female connectors. The high voltage of the power supply could be failing. There are 2 resistors that commonly fail or it could be several components failing due to age. Either way, its a straight forward repair with a little guidance. Your power supply is all original and should be rebuilt, you also need to add fuses to the bridge rectifiers to prevent a fire. Someone has removed the battery holder from the CPU board, if there was corrosion damage in the past it can be affecting the display blanking signal trace which will shut off the displays. Thanks for the input. I don't see any corrosion on the board where the batteries were removed. I don't see any corrosion on the board where the batteries were removed. Then you should remove the power supply and look for a cracked solder joint on the back side of 3J5 connector. you also need to add fuses to the bridge rectifiers to prevent a fire. Are you talking the two cabinet mounted BR's? what ratting should the fuses be? Here's the section on pinwiki addressing the addition of 2 fuses for the backbox-mounted bridge rectifiers, one for the lamp bridge, one for the solenoid bridge. 8 amp slow-blow are the fuses they recommend using. I used a Weebly fuse board for my special selonoids He discussed making one for the bridge rectifiers too.